The delivery times may vary, see cgv contact us before the purchase to have the exact deadlines. By clicking on immediate purchase, the customer certifies having read and accepted the general conditions of sale! Available at the bottom of this page! Primary transmission malossi power mhr. The system completely replaces the original primary transmission unit (25-tooth gear and 41-tooth crown) with a 26-tooth conductive gear and a 40-tooth driven gear with an elongated ratio of 7%. These ratios, besides the fact that they have a longer pitch, are narrower in order to work with the new Malossi Morse racing chain, not engaged, without the small contact springs and therefore lighter, with resistance and service life. Superior to the original model. Super t max goes even further. 6714757, is a malossi project. Pinion and crown torque htq z 26/40 with elongated ratio. Morse malossi chain racing lighter, thinner, without lateral friction. These ratios, besides the fact that they have a longer pitch, are narrower in order to work with the new Malossi Morse racing chain, not engaged, without the small contact springs and therefore lighter, with resistance and service life. Superior to the original model because "things that are not there are not likely to break". Malossi is happy and proud to present to its customers another masterpiece of modern technology. Couple pinion and crown htq z 26/40. Narrow-flank toothed crown pair, formed of a 26-tooth conductive pinion and a 40-tooth ring made of crimeless and hardened steel alloy, worked on malossi drawing using high accuracy. Profile of the teeth studied to guarantee maximum resistance and silence. Tooth contact area achieved with an extreme finish to ensure a long service life and high operating reliability. High standard of control over all components of the product, from raw material to finished component ready for sale. Finer chain, studied to eliminate side friction of the original chain. We recommend the modification to fit the malossi Morse racing art chain. 6114474b to original sprocket and crown pair or other manufacturers. Malossi disclaims all liability and therefore will not recognize any warranty in case of problems. Non contractual photo, illustration example !! choose the delivery method before paying. Mondial relay only for continental France not the islands, like Corsican .. the processing time of your order can vary 4 to 15 working days, contact us before the purchase !! anti-theft devices, batteries, spark plugs, chain kits, pinions, crowns, chains, clutch discs, air filters,, oil filters, fuel filters, oils, engine gaskets, spinnaker seals, brake levers and clutch handles, grip pads, jaws brakes, fixed and floating brake discs, brake pads, motorcycle tires, cross and enduro tires, scooter tires, quad tires, inner tubes, lamps and spotlights, wheel bearings and steering bearings, spraychain, turn signals, mirrors, fork tubes, cables, tank caps, handlebars, saddles, bolts, handlebars, valves and stoppers, contactors, workshop saddles, footrests, belts, exhausts, tools, top cases and windshields. Helmets, rain gear, clothing and anti-cold accessories, tire cover, etc. 03.25.55.74.71. Monday to Friday from 9h-12h to 14h-18h. 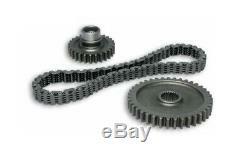 The item "transmission timing chain sprocket yamaha t-max 500 tmax 2001 2011" is on sale since Thursday, July 21, 2011. It is in the category "auto, motorcycle parts, accessories \ motorcycle parts \ other". The seller is "destocnet" and is located in / at bettancourt la ferée.